Since I'm pretty sick of sewing Summer clothes, I decided that I'm sewing what I'm calling "Pre-Fall". Those are things I can wear now with sandals and things that will transition into cooler weather. I thought this skirt was a good start. I loved the colorway of this print. It works now and it'll work with opague tights when it's chilly out. Pattern Sizing: 4 - 20. I cut the 16. Did it look like the pattern envelope once you were done sewing with it? Pretty much. Fabric: a silky print from Jo-Ann's (100% polyester) and I used a black crepe back satin from my stash for the contrasting binding. Were the instructions easy to follow? Very. I only read over them to see how the binding was supposed to be attached. What did you particularly like or dislike about the pattern? I liked the style of this skirt. I've had it since it first came out and I'm just getting around to making it. Pattern Alterations or any design changes you made: I lengthened it by three inches. Would you sew it again? Would you recommend it to others? I would not. Even if I did find the time to sew this again, it would be the other view. And there's another skirt that's similar (but cuter, LOL) that I'd rather make instead. 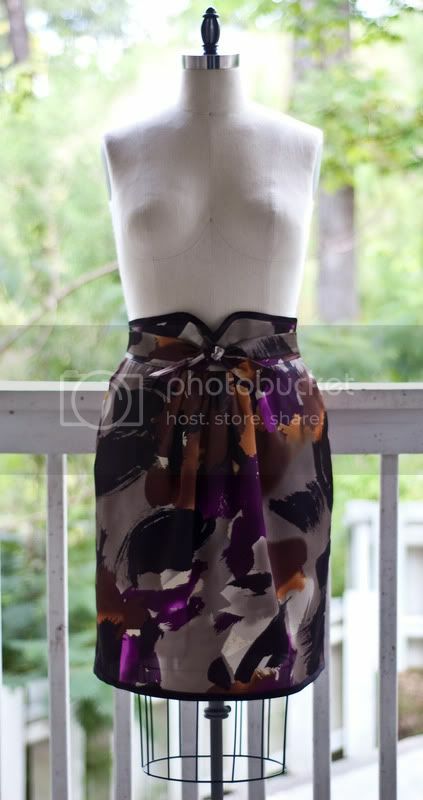 If you don't mind me asking, could you please tell me what was the cuter skirt you would rather sew, than to sew this simplicity skirt again? Thank you from Canada! This skirt is beautiful! I'm going to attempt to make it after not having sewn since high school. Out of all the pictures I've looked at, I think you made and wear this skirt better than anyone. I can't wait to make it now! Was it difficult to sew? Ooo am intrigued I was going to buy this pattern but if there is another one that may be in the running I would love to be in on it lol. Have you made this cute skirt yet? Can you share the pattern details with me? Ha ha ha. I know am crazy I didn't even realise, I have no concept of time, my eyes just zero in on the garment hence why I set up my Sassy Sewing Bewes fb page. https://www.facebook.com/SassySewingBees I see something and just go wow. Anyway it's going on my Sassy Sewing Bee's fb page at some stage. I will remember to say made in 2010 lol. Simplicity 2579 - Botanic Inspiration!